Find out how to use and find the information you are looking for on this site. Select an item on the list below to view. How can I ensure that I see the latest updates? Updates to planning schemes are usually made on Thursdays but can occur on any other weekday and may be made at any time of the day. The date a planning scheme was last updated is shown at the top of each planning scheme page under the scheme title. If you are expecting a planning scheme to be updated and the 'Last updated' date has not updated then you may need to refresh your web browser. You can do this by selecting the F5 key on your keyboard or the refresh icon on your mobile device. This will clear any local or cached copies of a web page that are stored on your computer. How do I view a planning scheme map? The maps for each planning scheme are located in the Maps tab on the home page for each planning scheme. The maps page has an index map of the planning scheme area that is overlaid with a grid that divides it into manageable areas. Each of these grid areas is identified with a number. To view the planning scheme maps that apply to each grid area you can either select the number on the grid area you are interested in or scroll to the bottom of the page and select the relevant grid area in the table. Where more detailed maps are required then an enlargement is provided. This is labelled and shown outlined in a dashed red boundary line. 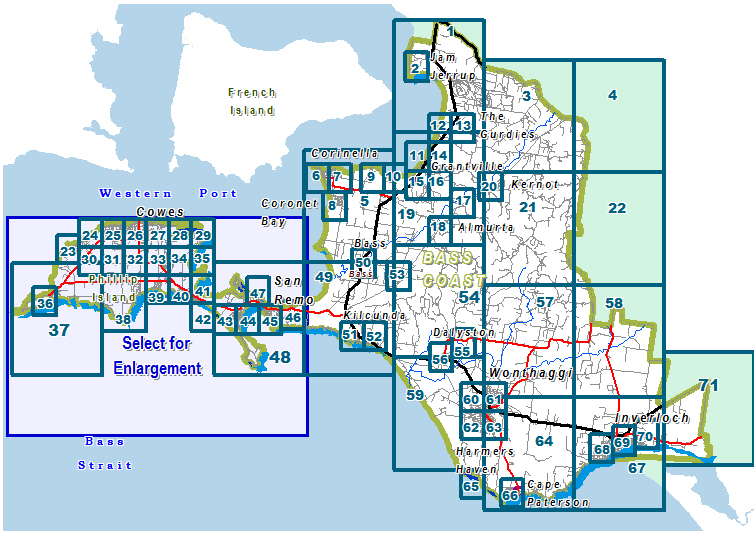 Open the enlargement map by selecting anywhere within the outlined area. It may also be selected from the list to the left of the index map. 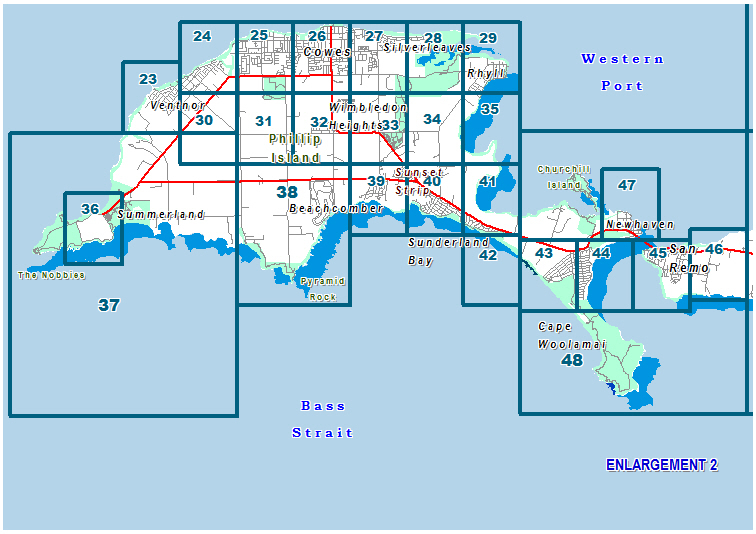 The planning scheme maps that apply to each grid area are displayed in alphabetical order in the grid area table. The number shown at the start of each individual map title refers to the grid area where each map applies to. The letter code refers to either the type of overlay control that applies to an area or identifies the zones map. Each map area will have one map that shows all the planning zones that apply to that area, for example 03ZN ZONES. Unlike zones, more than one overlay control can apply to a a particular area. Each overlay has a separate map, for example 03EMO Erosion Management Overlay or 03HO Heritage Overlay. The individual zones and overlays that can apply to land are shown in the Zones and Overlay Legend. What do the number and letter codes on the maps mean? There are a few different types of codes... some are just letters (eg. ESO), and some are a combination of letters and numbers (eg.10HO, HO7, FZ). Zone maps show all the land use zones that apply across the map area. 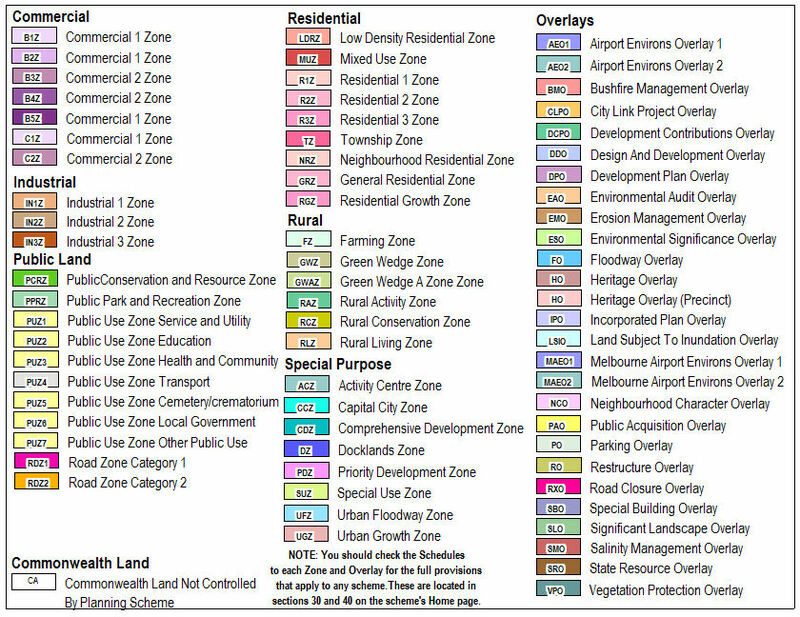 Each zone type has a code name that is displayed on the zone map, for example FZ indicates the Farming Zone, RCZ indicates a Rural Conservation Zone. While a zone map will show a number of different zone types across an area, an overlay map will only show the extent of a single overlay control across an area. Overlay codes will sometimes include a number at the end of the code that refers to specific requirements that are identified in a schedule to a planning scheme provision. For example, HO126 represents a particular heritage site listed in the Schedule to the Heritage Overlay and DDO4 indicates the Design and Development Overlay - Schedule 4. Every planning scheme map has a legend that shows the codes for the zones or overlay areas that appear on the map. All of these codes can be viewed on the Zones and Overlay Legend. How do I use the planning scheme ordinance? Planning scheme ordinance is the written part of a planning scheme. It describes the effect of any planning scheme provisions on a particular piece of land. The ordinance of every planning scheme is structured in the same way and can be thought of as a single document arranged like a book. Every planning scheme is provided in a consolidated version that allows you to download the complete scheme. Because these consolidated documents can be very large, the ordinance for each planning scheme is also provided as a series of individual documents that reflect the various clauses and sub-clauses that make up a scheme's ordinance. These individual documents are listed in the ordinance table in the same order that they appear in the consolidated version of the planning scheme, and in the scheme's Table of Contents. You can filter the ordinance list to limit the number of documents displayed on the web page. You can do this by choosing one or more of the options in the filter list. How can I find out when a planning scheme has been updated? You can subscribe to a RSS feed to receive a notification of an update to a planning scheme. Go to the Updates and Amendments page. Select the planning scheme(s) you wish to subscribe to from the list provided. Your web browser will monitor our site and will inform you when any updates occur to the planning scheme(s) you have subscribed to. Can I search a PDF? Yes. Once you have opened a PDF by using the find button. NB: this will only search the PDF you have open. Open the PDF you are interested in. A window will pop up - type in the word(s) you are trying to find. I haven't been able to find an answer to my question - what do I do now? If you have question about how to use this site then please contact us by email at planning.schemes@delwp.vic.gov.au or telephone the Victorian Government Contact Centre on 1300 366 356. If you have a question about the requirements of a particular planning scheme and how they are applied then please contact your local council. If you have a question about a planning scheme where the Minister for Planning is the planning authority (Alpine Resorts, Port of Melbourne or French Island and Sandstone Island) then please contact us at stateplanning.services@delwp.vic.gov.au.